Ohms law quiz is a simple test designed for you to test your knowledge of Ohm’s Law. 4. If P = 50 watt and R = 2 ohms, then I = ___? 9. If V = 10 V and R = 15 kΩ, then I = ___? 10. If I = 5 A and R = 10 Ω, then P = ___? Color coding technique is used to represent the values of resistors in the form of colored bands. 4, 5 or 6 bands are designed over the bodies of resistors. While 4 band resistors are most commonly available we’ll use them in next problems. The first and second bands represent a number while the third and fourth one represents a multiplier. 29. A resistor is color-coded with four bands, the first one being brown, second, black, third red, and fourth gold. The resistor connects to a 10 V source. Find the current flowing through the resistor. 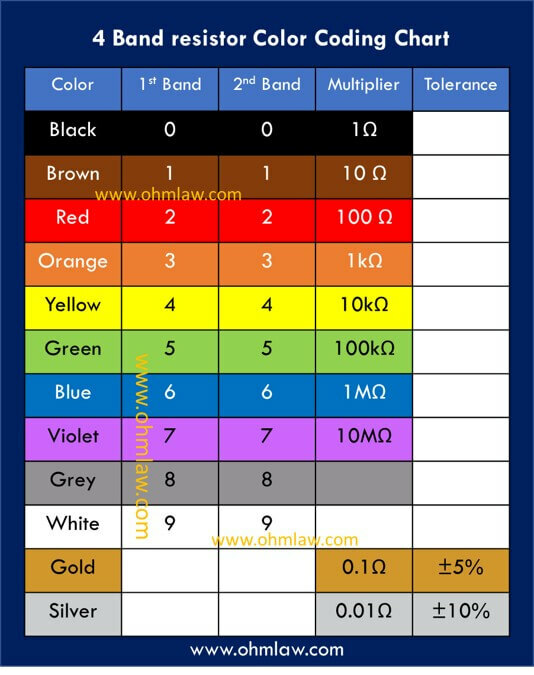 Solution: The resistor can be color coded from the chart as shown below. It is 1k Ohms resistor. Neglecting the tolerance we can easily use the Ohm’s statement I = V/R to find the current. 30 If 1st band = Yellow; 2nd band = Violet; 3rd band = Brown; and V = 47 V, then I = ___? 31. If 1st band = Red; 2nd band = Red; 3rd band = Red; and V = 44 V, then I = ___? 32. If 1st band = Brown; 2nd band = Black; 3rd band = Green; and V = 50 V, then I = ___? This portion of quiz involves series circuits. A series circuit contains two or more in which head of the one joins the tail of other and there is no other connection in between them. To solve such circuits simply add the resistors and obtain a single equivalent resistor, then apply the law to find either current or voltage. 38. Two parallel resistors both having their values 28 ohms are connected in parallel. The overall current provided by the 28 V source is. 40. Repeat the above problem for resistor values of 30 ohms each when the source is 60 V.